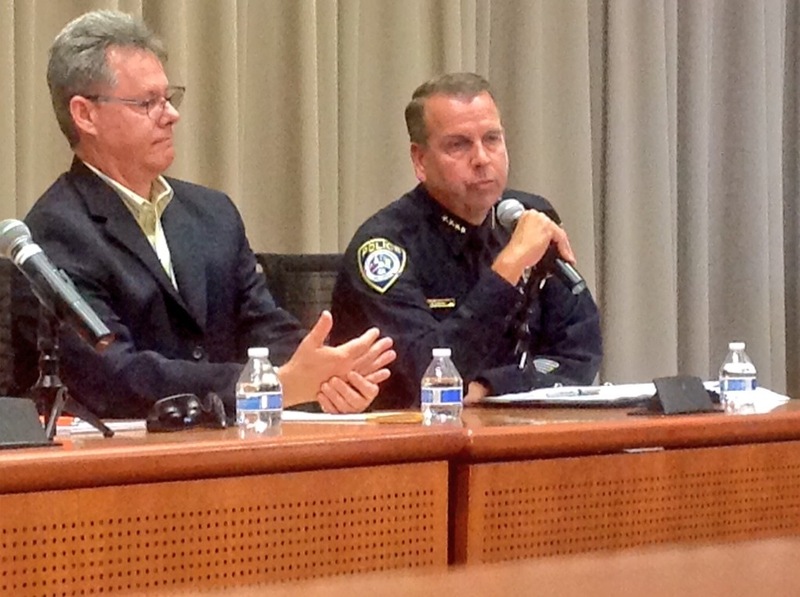 Escondido Police Chief Craig Carter talks to the media gathered at San Diego SPJ’s wildfire panel. Credit: David Frerker. In the middle of what looks to be a very busy fire season, San Diego journalists, students, residents and government officials gathered to hear from experts on how to best cover wildfires. If you missed the panel, you can read about it through this Storify of tweets posted by David Frerker, the president of San Diego State University’s SPJ chapter. You can also watch his video below. Thank you to our panelists Cal Fire Battalion Chief Nick Schuler, incident commander for the May 2014 fires; Marine Col. Will Hooper, the deputy operations officer who discussed military aircraft operations with the media; Escondido Police Chief Craig Carter, whose department was active as fires raged across North County; KFMB/Channel 8 News Director Dean Elwood; and U-T San Diego public safety editor/online news director Tom Mallory. We appreciate the time you spent sharing important information with our members, other journalists, other public safety officials and members of the public. Thanks for coming to the 2014 SPJ Awards Banquet!